The Pz.Kpfw. 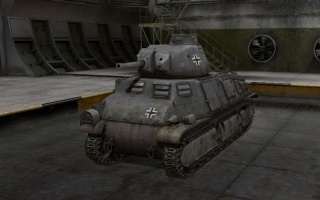 S35 739 (f) is a German tier 3 premium medium tank. 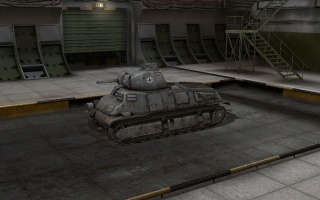 It has good maneuverability and acceleration, which is expected for a medium, and has a quite decent gun for its tier; it will have no problems facing lower-tier tanks. Its size does make it vulnerable to side shots; therefore, it is recommended to always face front the enemy in order to minimize the damage received and provide a smaller target for your enemy to shoot. As it has weak armor, it's always a good idea to team up with a group and support them with flanking shots. 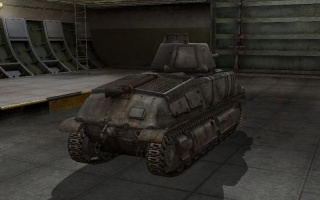 When the French Somua S35 was introduced in 9.7, this tank was clearly worse than it, as it had a worse gun selection and radio. It excels a lot. There's quite a lot of bounce with a correct angle and the gun is accurate enough to kill a far target (500m). A lot of fun (and of kills !) is waiting for you if you can remember to use your excellent turret armor and unmatched long ranged ability at tier 3. However, most of the tier 3 TD's can penetrate you, and the Marder II and T82 can potentially 1 or 2 shot you, so resort to different tactics for these opponents. It's a completely different play style. You should play as a support tank, but you can still have a large influence on the outcome of the battle. 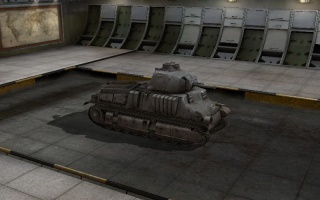 It is woefully outclassed against tier 5 tanks. Caution is strongly advised as you are unable to penetrate the armor of most heavy tanks except in extreme weak points, and even then the damage is insufficient. 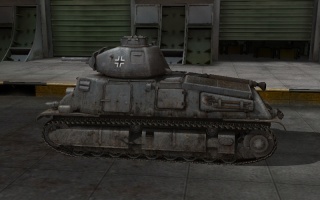 Avoid tier 5 tanks like the KV-1 and AT 2 at all costs, as attacking them from even the sides or rear will result in no penetration. Prioritize support tanks and scouts, hanging far in the back line and hiding whenever possible while intercepting attacks on your arty. With precise aiming and patience you can still harass some bigger enemies; tracking is always an option. Consider loading some gold rounds as well, since the rounds are cheap and have sufficient penetration even for heavies if you take a bit of time to aim. Somua S35 at [Bovington Tank Museum]. The SOMUA S35 was a French cavalry tank of the Second World War. Built from 1936 until 1940 to equip the armored divisions of the Cavalry, it was, for its time, a relatively agile medium-weight tank, superior in armor and armament to both its French and foreign competitors, such as the contemporary versions of the German Panzerkampfwagen III. It was constructed from well-sloped, cast armor sections that afforded it good armor protection but made it expensive to produce and time-consuming to maintain. During the German invasion of May 1940, the SOMUA S35 proved itself to be tactically effective, but this was negated by strategic mistakes in the deployment of its units. After the defeat of France in June 1940, production was limited to a number of 430, and captured SOMUA S35s were used by the Axis powers. A derived variant, the SOMUA S40, had an improved suspension, lowered hull, and cast and welded turret armor, and had been planned to replace the original version on the production lines in July 1940. On 26 June 1934, specification changes for an Automitrailleuse de Combat (AMC) issued for cavalry use led to the design of the SOMUA S35. These called for a much heavier design than had been originally specified in 1931. The new type had to be immune to antitank guns. On 17 May, the Army had already contacted a subsidiary of Schneider et Cie, the Société d'Outillage Mécanique et d'Usinage d'Artillerie (or SOMUA) based at Saint-Ouen, to build a prototype. The company accepted this proposal on 16 July and construction began on 12 October 1934. The prototype, with the name AC3, was ready on 14 April 1935. It was tested from 4 July until 2 August 1935. Following testing, a pre-series of four was produced of the improved type, the AC4, to be tested until 27 January 1938. 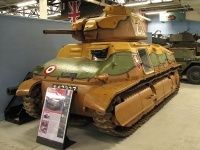 On 25 March 1936, the AC4 was taken on as the standard medium tank of the Cavalry with the official new name Automitrailleuse de Combat modèle 1935 S (or AMC 1935 S), and a first order for fifty was made. 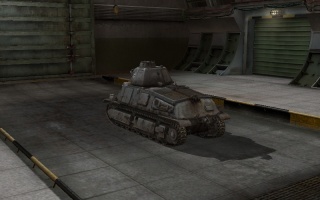 The tank was then more commonly known as the SOMUA S35 (S again for SOMUA and 35 from 1935, the year of introduction). Today, the even shorter abbreviation S35 is more often used, usually with a hyphen (i.e., S-35), but this latter form is never seen in contemporaneous French sources. These first vehicles had the standard APX1 turret fitted with the short 47 mm SA 34 gun. The mass-production vehicle would have the longer SA 35 gun. Originally, a total production of 600 was planned, but the second order was limited to 250 for financial reasons. Later, a third prewar order of 200 was made. The hull and turret were castings with a maximum thickness of 47 mm and 40 mm respectively: the former of four armor sections, bolted together. Two longitudinal plates formed the bottom, and the superstructure was divided into a front and back section. The turret was a variant of the APX 1 as used on the Char B1. The APX 1 CE (chemin élargi), with its larger (1,130 mm (44 in) versus 1,022 mm (40.2 in)) turret ring, allowed the radio operator to assist the commander in loading the gun from an ammunition stock of 118 shells (90 AP, 28 HE) and 2,250 machine gun rounds. Still, as with the B1, the commander was expected to direct the tank while also aiming, loading, and firing the 47 mm SA 35 main gun, though radio duty could be left to another crew member. Radios were planned to be part of the standard equipment of S35s. In practice, the platoon commander had an ER29 (émetteur-récepteur) set for communications with higher command levels, but a shortage of the short-range ER28 sets for platoon communication meant that the other four tanks were never fitted with any form of radio. In some units, all tanks had antennas, but the program to fit the sets themselves was postponed until the summer of 1940 and susequently, overtaken by events. The suspension was designed by Eugène Brillié, the same man who developed the first French tank, the Schneider CA1. He had worked with the Czech Škoda company and based his design on that of the LT35: eight road wheels paired on four bogies with leaf springs and an equally large tension wheel. The first fifty vehicles had tracks consisting of 144 track links, each link with a length of 75 mm. Later vehicles had 103 links of 105 mm length. The engine was in the rear of the hull side-by-side with two self-sealing fuel tanks of 100 and 410 liters, respectively, separated from the fighting compartment by a firewall bulkhead. The (official) 200 hp engine, designed by Javier-Sabin, drew fuel from the smaller tank, which was itself automatically replenished from the larger one. Inexperienced crews sometimes made the mistake of only filling the smaller tank. Engine and suspension maintenance was difficult and time-consuming due to poor accessibility, though this was improved in later vehicles. A captured S 35 in service with the Wehrmacht. The SOMUA S35 had an operational flaw, which was its poor mechanical reliability. The suspension units were too weak and too complicated, demanding enormous maintenance effort, especially since the cast armor modules did not allow easy access to the suspension and engine. This had been caused by no central institution regulating French tank development. The Army branches issued very vague specifications, leaving it to private enterprise to come up with precise proposals. French machinery was often outdated, and the designs reflected the limited existing production facilities. To introduce a Christie suspension, the obvious solution, was impossible without a thorough industrial modernization and raising of quality standards. The strategic flaw was the high unit-price of the tank and the limited number of large cast sections that could be produced. This implied that the absolute number of S35s produced would be low. The tank had to be supplemented by a cheaper type, and the only one available had been the Hotchkiss H35 with its much inferior armor, armament, and speed (even after it had been improved to the "H39" variant). The Cavalry had a very-low opinion of the fighting value of this light tank. It decided to keep a large number of S35s in the core of its armored divisions and rejected the easy method of raising more of them by dividing the S35s among the Cavalry Light Divisions. In contrast, the Germans distributed the also-low number of PzKpfw IIIs partly to their Leichte Kavalleriedivisionen. It also decided against the continued mass production of even lighter vehicles like the AMR 35 and AMC 35. This, again, implied that the Germans would, in May 1940, have a large superiority in strategically-mobile large armored units: ten to three because the four French armored divisions of the Infantry did not possess sufficient organic artillery and infantry to operate effectively as an independent role. France intended to raise many more armored divisions for use in a decisive offensive in 1941. But, as French production capacity for cast armor sections was insufficient at the time of the defeat, negotiations were ongoing to employ American producers. During the crisis caused by the German attacks in June, it was even proposed to let them build 2000 vehicles. Four tanks of the AC4 pre-series of the S35 entered service in January 1936 with the 4e Cuirassiers. At the end of 1937, the SA 35 gun became available and deliveries of the main production series could begin. By mid 1938, a hundred had been produced. 270 had been produced by 1 September 1939, and 246 delivered. On this date, 191 served with the troops, 51 were in depot, and four had been sent back to the factory for overhaul. After the outbreak of war, a fourth order of 200 was made, bringing the ordered total to 700. Later, it was decided that from the 451th vehicle onwards, the tanks would be of the improved S40 type. Production, in fact, totalled 430 by June 1940, including the prototype and the pre-series. Of these, about 288 were in front-line service at the beginning of the Battle of France with the three armored divisions of the Cavalry: the Divisions Légères Mécaniques, or Mechanised Light Divisions ("light" here meaning "mobile"). Each of these had an organic strength of eight squadrons with ten S35s. Each squadron had a matériel reserve of two tanks, and regimental and brigade commanders (in practice) had personal tanks as well, resulting in a total of 88 vehicles per division. Furthermore, 31 were present in the general matériel reserve: 49 in factory stocks and 26 being processed for acceptance. These vehicles were later issued to several ad hoc units, such as the 4th DCR (commanded by Charles de Gaulle) which received 39, part of 3e Cuirassiers, the 4th DLM (10), and some Corps-francs Motorisés (about 25). Also the destroyed 1st, 2nd, and 3rd DLM were reconstituted with a small number of tanks; the first two divisions received ten S35s and the third, twenty. S35s further served with the 7e Cuirassiers (25) and a platoon of three was present in the 3e RAM of the 3e DLC. In May 1940, during the Battle of France, the DLMs had the difficult task of making a quick advance into the Low Countries, followed by a holding action to allow the infantry divisions following behind to dig themselves in. The 2nd and 3rd DLM were concentrated in the Gembloux gap between Louvain and Namur, where there were no natural obstacles to impede a German advance. They had to spread out, somewhat, to hold that sector against incursions by the German 3rd and 4th Panzer Divisions. This was necessitated by the local tactical situation and did not reflect any fundamental difference in doctrine between the use of the DLMs and the Panzerdivisionen. Both types of units were very similar in equipment, training, and organization, as the German armored divisions were primarily intended for strategic exploitation; the breakthrough phase was preferably left to the infantry. The resulting tank battle from 13 to 15 May, the Battle of Hannut, was with about 1700 armored fighting vehicles participating, the largest until that day and still one of the largest of all time. The S35s gave a good account of themselves, proving to be indeed superior to the German tanks in direct combat, but were rather hesitantly deployed as the French High Command mistakenly supposed the gap was the German Schwerpunkt, and tried to preserve their best tanks to block subsequent attacks by the rest of the Panzerwaffe. When it became clear that the attack was really a feint and the forces in the north were in danger of being cut off by the German advance south of Namur, the 1st DLM, which had been quickly moved 200 kilometres to the north to help the Dutch, was hurriedly rushed south again. The resulting disorder and breakdown of most of its S35s rendered this unit, the most powerful of all Allied divisions, impotent. It was defeated by the German 5th Panzerdivision on 17 May. The other DLMs fought a delaying battle, participated in the Battle of Arras, and then disintegrated. Committing its only strategically-mobile armor reserve early in the battle had made the French Army fatally vulnerable to a German strategic surprise. After the June 1940 armistice, S35s were sent to West Africa to bolster the hold of the Vichy regime in that region. They were issued to the 12e régiment de Chasseurs d'Afrique that, after French forces in Africa had sided with the Allies, operated them against German and Italian forces during the Tunisia Campaign. After taking part in the Tunis victory parade, 12e RCA's S35s were replaced by M4 Shermans, but crews often affixed the SOMUA plate on their new tanks. 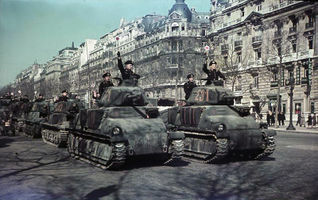 After the liberation of France in 1944, an armored unit was raised, the 13e Régiment de Dragons, using French matériel, among which were seventeen S35s. 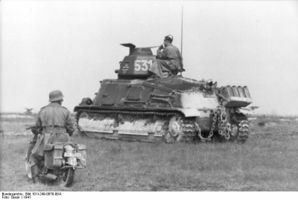 After the fall of France, a number of S35s (297 were captured according to some sources) were taken into service with the Wehrmacht as the Panzerkampfwagen 35-S 739(f). The Germans modified the cupola by cutting its top off and installing a simple hatch. On 10 December 1940, the first German tank unit equipped with the French Beutepanzer was formed: the 201st Panzerregiment with 118 tanks, 36 of these were S35s, the rest "38Hs". On 10 February 1941, the 202nd Panzerregiment was established, and both regiments were united into Panzerbrigade 100. On 27 January, the independent 301st Panzerabteilung was formed with French vehicles. The total of S35s in the Wehrmacht was thus ninety. On 22 March, this independent battalion replaced the Second Battalion of the 201 Panzerregiment, which was renamed the 201st Panzerabteilung and sent to Finland in June, the only German unit with S35s that would fight on the Eastern Front. The 21st and 25th Panzerdivision in 1943 used some S35s when reforming after having been largely destroyed. Some vehicles had their superstructure removed and were used for driver-training. There were still twelve S35s listed as in German service on 30 December 1944. Some of the captured S35s were delivered to German allies: 32 to Italy in 1941, two to Hungary in 1942, and six to Bulgaria in 1943. They were used by the Italians for training purposes and to equip a reserve unit. The Bulgarian vehicles were, after the war, used by police units. From the S35, SOMUA developed the SAu 40 self-propelled 75 mm gun in 1937. Its drivetrain featured an extra wheel to improve off-road capabilities, and the hull was wider. Only one prototype was built in this configuration. It fought in June, probably together with a small number of mass-production vehicles, and was fitted with the powerful 47mm SA 37 gun. 72 units had been ordered on 1 May, 1940. In order to address some of the shortcomings of the S35, SOMUA presented the improved AC5 type in 1939. Based on the SAu 40 chassis and its Char G1-project, but with the original width, this SOMUA S40 had a welded ARL 2C turret and redesigned cast superstructure. Both to lower production costs and to improve protection standards, the cast sections were made and delivered by eighteen subcontractors. However, they were often of inferior quality. The new suspension strongly improved the climbing capacity, of which the Cavalry had officially complained in November 1938. Its greater weight was compensated for by lowering the hull height by fourteen centimeters, causing a weight gain of four hundred kilograms. In contrast, the engine deck was raised to fit an improved 230 hp engine, increasing maximum speed to 45 km/h, although the new engine was not yet available in the summer of 1940. The armament and general nominal armor-base would remain the same, but first steps to improve these, which might have naturally evolved into an "S 41", had already been taken in the Spring of 1940, when plans were made for a 60 mm welded ARL turret. A first order of fifty vehicles was made on 21 September 1939. It was intended to become the main production type, superseding the S35 from the 451st vehicle forward with total orders having reached four hundred hulls, but none were completed at the time of the German invasion. The first vehicles were planned to be produced in July; hull sections had already been cast since November 1939. Of the first 160 vehicles, eighty had been planned to be made of an intermediate type with the old turret. After the armistice, plans were developed to resume production, partly for the benefit of the Axis powers. On 28 May 1941, the German ambassador in France, Otto Abetz, concluded an agreement with the French government, the Protocols of Paris. These included the intention to produce eight hundred SOMUA S40s: two hundred for France itself, and six hundred for Germany and Italy. However, Hitler, suspicious of a French rearmament, declined to ratify the agreement. In November 1940, the Japanese government requested Germany to allow production for Japan. When Japan became an ally on 9 February 1942, it was decided that France would produce 250 SOMUA S40s for the Japanese Imperial Army, the first to be delivered in twelve months time, with production to reach a peak of eight vehicles per month in eighteen months. The events of November 1942 precluded both production and delivery. Early in 1942, France was finally given permission to re-equip its forces with SOMUA S40s, now that the type had become obsolete and the Germans had lost interest. Two versions were considered on 24 April 1942, both fitted with the larger FCM-turret, originally developed for the Char G1. The first would have been armed with the SA 35 gun operated by a two-man turret crew, and the second with the longer SA 37 gun placed in a three-man turret. France foresaw a production of 135 vehicles to equip three squadrons of 45 each, but the preparations were halted in November 1942, when the whole of France was occupied. However, a clandestine development continued, of a SARL 42, fitted with the ARL 3 turret and a 75 mm L/32 or L/44 gun using an optical range finder. To limit weight, its side armor was diminished to thirty millimeters. In 1945, it was proposed to build a tank destroyer by refitting existing S35 chassis with a superstructure for the British 76.2 mm 17-pounder gun. S35 on parade in Paris. 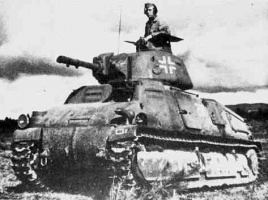 S35 operating on the Eastern Front.